This is a guest post by Brian Edwards. If you'd like to guest post on this blog, click here. A year ago, I was sitting in my chair wondering just what the heck I had gotten myself into. My newly adopted, four-legged bundle of joy was happily chewing a hole through my pants, had completely destroyed an innocent ficus, had presumably eaten an entire rubber chew toy (I have not seen it since), and was sizing up the recliner for a bloody assault – it was only 8 in the morning. What gives? I thought. Dogs are supposed to relieve stress. It wasn’t a false notion, not really, and the problem wasn’t even with the dog. The problem was me. You see, I had fallen into the assumption that a new dog would GUARANTEE to reduce stress. I had adopted a puppy thinking that they were just so darn cuddly and cute – factors that would only amplify the stress-relieving qualities of this wonder mutt. What I didn’t realize, mostly because of my own ignorance and my flawed, child memory of my last dog, was that dogs have been and always will be a lot of work – especially puppies. It’s now a year later and my puppy is not so much a puppy as he is an inquisitive youth. Always trying to stick his nose into things and getting into mischief as a result. A year later, and the question remains: can a dog really reduce stress? Studies have shown that dogs can not only relieve stress but can even work wonders for those in need of physical therapy. Children too timid to read out loud, people who have suffered traumatic injuries and even soldiers with PTSD have all benefited from their own canine companion and, let’s face it, there’s a reason they are called man’s best friend. However, to simply assume that a dog will make all your problems go away puts undo stress and unfair expectations on a dog that is just getting to know you. In fact, starting out, a dog may actually cause more stress before it actually relieves any. This isn’t too suggest that you should avoid a dog at all costs for fear of the stress it may bring, it just means that you need to understand what you are getting yourself into. Dogs are a lot like children, they don’t know any better and they rely on you to guide them through their turbulent transformation from domesticated animal to domesticated companion. 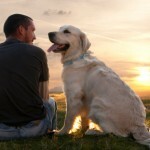 In some ways, the process of training your dog is its own source of stress relief and if you are able to make that connection with your dog, then the therapeutic benefits in the long run can last a lifetime. For centuries, dogs have walked beside man and some would argue that without them, we might not be alive today. However, this does not mean that a dog will instantly live and die for you or relieve stress straight out of the box. A dog requires time and commitment, but once you bridge that gap, you will have a friend for life. Someone to talk to, someone to play with, and someone who you know will never turn their back on you and, for some, that is alleviating enough. Oh, and in case you were wondering, my mutt Murray and I are doing just fine. It was a rocky start that finished nicely. This guest article was written by Brian Edwards. If you have a new dog and you are having a hard time, do some research and look into some training. Fire up your clear wire internet and see what’s out there. Thanks’ for the great post – really liked it. Regarding stress relief, I have to say that pets really help. In my case, a dog. Dogs always understand when you are sad or stressed. Also you can always talk to your dog. A sad thing is that dogs cannot talk back. But it is minor minus. In any case, if you are stressed and there is a possibility to get a pet, I strongly recommend it. Wishing all the best and good post in the future.